Yesterday Simone Biles was in a significant amount of pain and was brought to the emergency room. U.S. gymnastics officials thought she might have appendicitis and were starting to work out how to approach the team event without the superstar on the roster. It turned out to be a kidney stone. 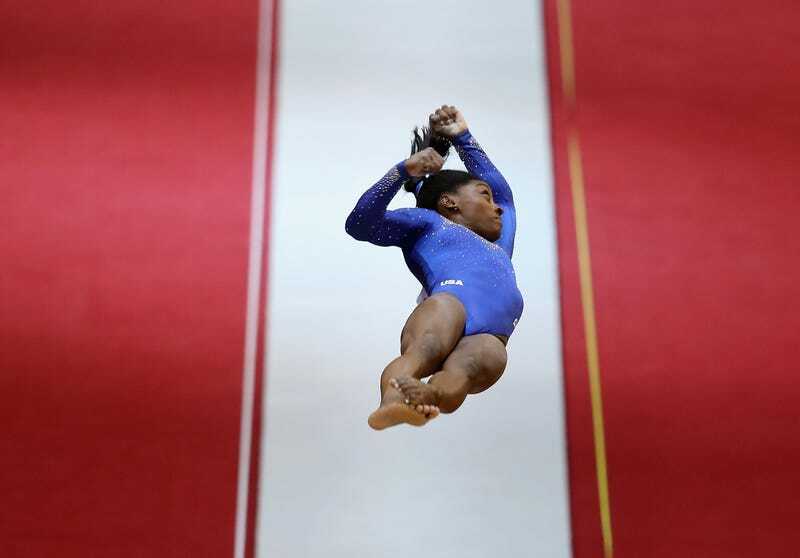 Very painful, of course, but at least Biles did not require emergency surgery. Twenty-four hours later, Biles was back in a leotard at the Aspire Academy in Doha, ready to compete. Because of doping rules, Biles couldn’t take the “hard stuff.” To get through four events today, she just had to bear the pain. Biles’s boyfriend, former U.S. national team member Stacey Ervin, called attention to his partner’s heroics on Twitter. The rest of the U.S. team was also brilliant in qualifications. Defending world all-around champion Morgan Hurd placed second among the U.S.—and second overall thus far with about half of the field still left to compete tomorrow—with a score higher than what she earned to win the world title last year. Beam specialist Kara Eaker posted the second highest score on that event (behind Biles, of course). Eaker’s score is more than likely enough to earn her a spot in the beam apparatus final. The U.S. team total of 174.429 was more than twelve points ahead of Japan, which is currently in second place. While that margin is likely to shrink when Russia and China compete tomorrow, the U.S. point total is insurmountable even for those two powerhouse programs. The top eight teams start from zero in the team final so this impressive lead won’t carry over. Biles is positioned to earn spots in all four event finals with about half the field still to compete. She currently has the top score on vault, beam, and floor, and is in second behind Nina Derwael of Belgium on the uneven bars. The top eight gymnasts on each apparatus—max two per country—qualify to the event finals.